1 of 5 Place carrots, celery, onion and garlic in a food processor; pulse until finely chopped. 2 of 5 In a large bowl, mix vegetables, ground beef, diced tomatoes, beef broth, tomato paste, sugar and beans. Add half of each: Italian seasoning, salt and red pepper flakes. Stir until combined. 3 of 5 Place mixture in a 6-quart slow cooker and cook 5-1/2 hours on high or 8-1/2 hours on low. 4 of 5 Stir in remaining Italian seasoning, salt and red pepper flakes. Cook for an additional 30 minutes. 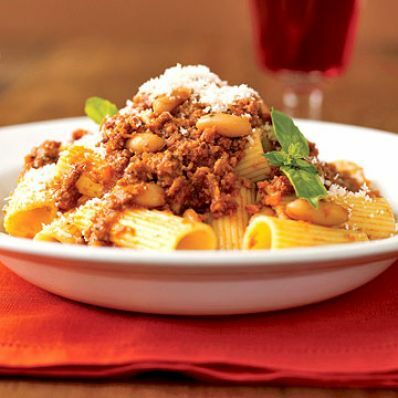 5 of 5 For 8 servings, toss half the meat sauce with rigatoni; serve with grated cheese, if desired. Reserve other half of the sauce for future meals. May be frozen, tightly covered, for up to 2 months.